So today Franz turned 60 years old. 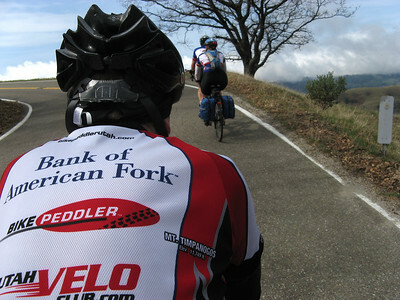 We started the celebration yesterday with a big bicycle club ride and lunch at our house. 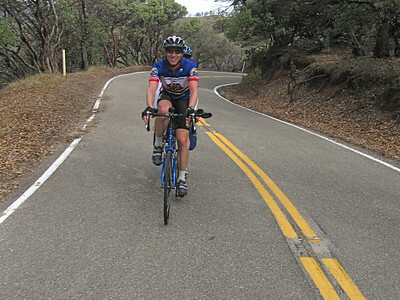 About 40 people showed up, riding anywhere from 67 to 116 miles and climbing up Henry Coe. 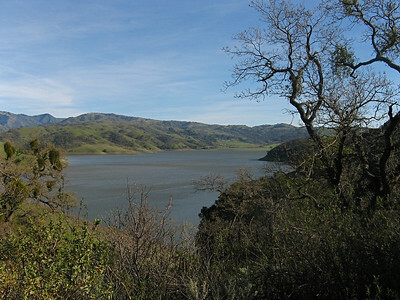 Coming down the mountain was simply beautiful this time of the year with the lake full and the hills a lush green. It reminded me of the hills in Switzerland. It was a lot of fun and the weather was great. 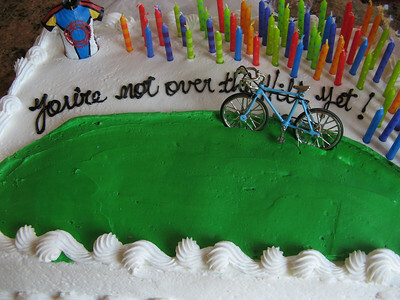 Ann made this cute cake that said “you are not over the hill yet” with a bicycle climbing the hill. We tried to light all 60 candels but the fire alarm went off and the cake was melting from the intense heat. Today is the actual birthday and another great day in California and it coincided with Easter. Ann cooked a great meal and we ate out on our deck. You can see in the picture the new table we bought for the deck. It is great with a “Lazy Susan” built in the center so Ann just put the food there and we rotated it around to take what we wanted for our plates. It was very relaxing and we sat under the umbrella for sometime just talking after eating. Ann then gave me my birthday present. It is a real cool cycling jacket that is very lightweight and compactable, but is made of some special fabric that when it gets wet, it undergoes a molecular change and becomes somewhat water proof. 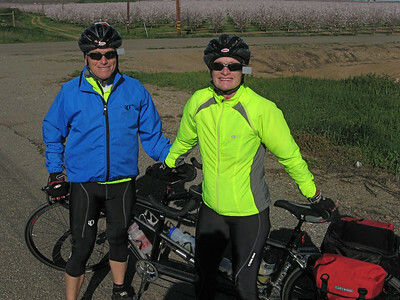 About 25 cyclists enjoyed a weekend of biking together for the Patterson Overnighter, led by Russ and Sheila. 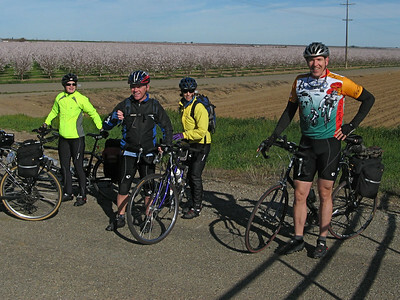 We all started in Milpitas with more than half of the riders on tandems, I believe about 8 tandems. It was a bit cool as we started, be we all warmed up as we started to climb up Mt. Hamilton. Russ and Sheila had waited near the bottom to make sure everyone made the correct turn, but we figured they would catch us soon. As we climbed the temperature dropped constantly and it went down to 43 degrees at the summit. 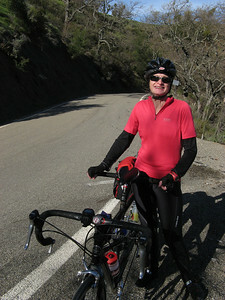 But as we descended down the backside the warmth returned and it was very pleasant for the ride over to the junction for lunch. 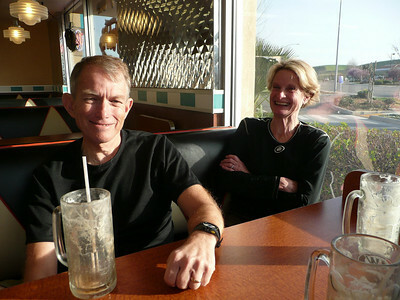 We did have some headwinds so we thought at the time, maybe tomorrow we will have a tailwind on the return.The ride down Del Puerto Canyon was fast and fun and we arrived in Patterson soon after 3 pm where many of us enjoyed a rootbeer float. Some new restaurants had opened in the area so we all tried a new Italian restaurant called Strings Italian, which turned out to be very good. That evening we could hear the wind all night. When I finally got up early I looked out the window to see the trees blowing in the wind, but these were tree limbs without leaves. I could see the direction of the wind was in the exact opposite that we would be traveling. So much for a tailwind on return. At 8 am, we all started out together to brave the wind. It was rather cool, but it was the wind that was most difficult. It was so strong I had to keep my hands on the hoods and could not move them to the top of the bar because that would not provide enough leverage in case a gust was going to blow our tandem over. We averaged only 7.5 mph for the first 20 minutes, even though we were going flat, on a tandem. Some riders were following further behind, especially those on single bikes. After about an hour, the winds went from crazy to just real strong. We plugged our way along the canal. 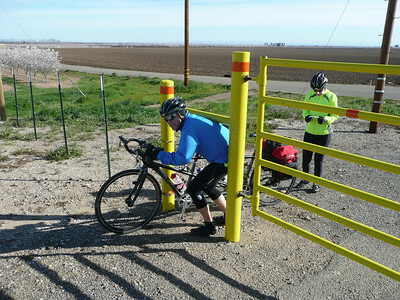 We had to stop several times to get through the barriers. Some of us did it the hard way. Some did it the easy way. We all needed a break from the wind. We asked Mike to take this picture of us, but from his high vantage point, it made us look real short. I guess that is how we look to the world. At mile 27 we finally made it to the first break. It took us nearly 3 hours to make that distance and it was all flat. We all needed to get some food and a rest. About a mile further down we made the turn onto Corral Hollow Road and the direction was such that we were finally out of the strong headwinds. We stopped again in Livermore for a sandwich. We found a Subway Sandwich shop near the Lucky’s where people were going to take a break. 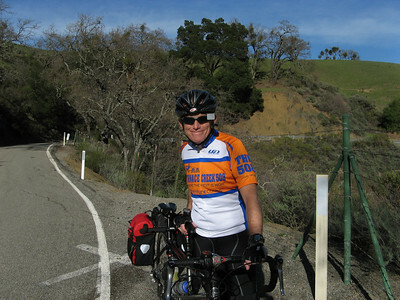 After about 30 minutes we made our way back, over Calaveras Road. It was beautiful this time of the year. It was a great trip. The ride leaders did a great job and the company of everyone made for a great weekend. This morning I was listening to the news about some jumbo jet that was trying to make a landing in a strong wind and almost crashed. I thought, hum … I didn’t realize they had an airport in Patterson.